At an Artists' Charity event "Na Lima Hana" at the Hilton, Waikoloa (as long ago as Thanksgiving in 2014) I was flattered by another artist there - Laura Roberts - who purchased earrings of a trial design that I was considering for possible introduction at some uncertain future date. She wore them at her own exhibit for the rest of that event. Laura catches everybody's eye with her gentle good looks and the trim slender figure of the confidant professional Boat Captain and PADI (Professional Association of Diving Instructors) Master-Instructor that she is. 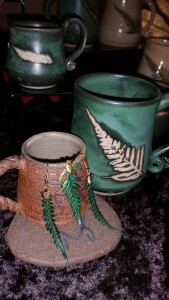 She is also a skilled artist in clay, pottery, painting and iron work and presents herself as Dread Pirate Pottery from Kona, on the Big Island of Hawaii. Her unexpected endorsement for my unconventional product, was a boost to me yet with conflicting priorities I was not able at that time to bring that design to finality. 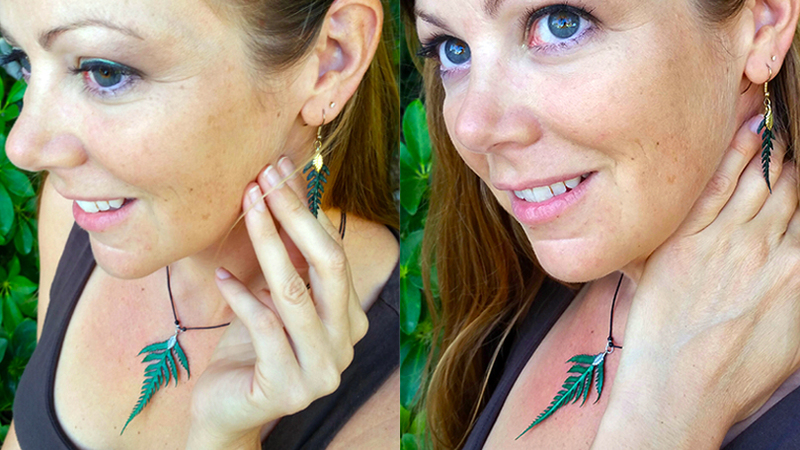 Imagine my surprise when a year later, at that next annual Na Lima Hana, there was Laura, not only wearing my earrings, but having carried their theme through into her pottery with a series of delightful Hapu'u fern designs. That did it! Because of Laura's so positive endorsement, I have at last finalized the formulae and am currently making enough finished product to launch real Hapu'u leaf pendants and matching earrings for Easter, the Merrie Monarch Festival, the Kona Annual Orchid Show and Mother's Day and in early June, the Hilo Orchid Show. They will be in the website very soon. 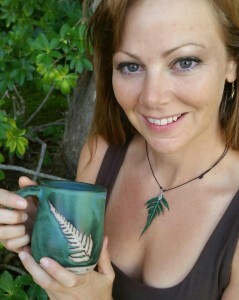 For contact with Laura over her full Hapu'u leaf pottery range go to www.dreadpiratepottery.com or contact her directly at dreadpiratepottery@gmail.com or 808 339 3070. ← Which was the Unique Orchid?